« Is Romans 13 for American Christians? Preparing for a garage sale of my Mom’s things has been a life-changing experience for me. My parents were pretty typical of people who were born in the 20s, spent their youth during the Depression of the 30s, were young adults during WWII, a young family in the 50s, struggled a bit through the sixties, aged in the 70s and 80s. Dad died in 1989. Mom lived by herself but continued to work another ten years, then she grew frail and died this year at the age of 91. That’s a summary of two people’s lives in just four lines of words—more than most people get. Financially, I think they were pretty average as well. Dad grew up as an only child in a small Kansas town. His father managed the grain elevator for 42 years, so they had a good, steady income, but nothing lavish. Mom grew up on a farm in Justin, Texas, one of 12 children. Her father died in a wagon accident when she was a young teenager, and her mother stayed on the farm with some of her sons for many more years—just sustaining the family, not accumulating much materially. Mom and Dad married in June 1945, both of them with what we today would call good marketable skills. Dad had chosen extensive technical training in electronics over college. He was first a radio operator for Braniff Airways, then worked for Bendix, training people to repair the fantastically popular, newly affordable televisions. When they moved to Fort Worth with their toddler son (me!) in 1949, they rented a small 900 sf house. Shortly after the twins were born in 1950, they bought their first house—a modest two-bedroom frame home in a new neighborhood—very middle class for the 1950s. Dad worked hard, managing the Electronics Department for Leonard’s Department Store—the Macy’s of Fort Worth in the 50s. Mom stayed home and had child #4 in 1955. We were now a family of six in two bedrooms and one car, but we had all we needed–not everything we wanted—pretty much like everyone that we knew! In 1958, we moved to a new 1300 sf three-bedroom house near the new Christian school (FWC)—a big stretch financially for our family. The house payments were $74/month and tuition was $10/month per child. We couldn’t really afford it, so when I was in the 7th grade, I started working off my tuition by sweeping classroom floors after school each day, a job I continued until I graduated from high school. The 60s were hard on the family. Dad’s health began to fail to the point that he lost his job. Mom had gone to work shortly before #5 was born in 1961. We kids were pretty much on our own to figure out money for college—or not! But that was pretty normal too. When Dad died in 1989, he left Mom less life insurance than the funeral cost, but the house was paid off and with no large outstanding debts, her income from teaching during the day and working at Foley’s at night, enabled her to live modestly. We teased her that she took advantage of her Foley’s discount so often that she probably lost money by working at Foley’s. She was of that generation that just could not pass up a big discount or a great bargain—even for things you didn’t really need right then—because you might need it later and you might not have the money for it then. So, for the last 20 years of her life, Mom accumulated—nothing expensive, nothing even of great sentimental value. Between Foley’s and garage sales, Mom accumulated! Now she was not a hoarder like you see on TV, but she did have a hard time throwing anything away. She was very generous about giving things to people if she thought they would like it—but she didn’t give things away, just to clear out space—nothing. So now that she is gone, that is our task. So much of what she collected over the years is completely valueless now—shells, rocks, newspaper clippings, shoes, clothes, cheap pictures of The Last Supper, fingernail clippers, pens, books—yes, even books. That’s one of the transformative things that I’ve learned. No one wants old books—not rare books—just old books. My dad was a voracious reader, He had hundreds of books, many James Hilton paperbacks, Mathematics for the Millions, Fort Worth Christian Lectures, English-Spanish Dictionary, Complete Concordance of the Revised Standard Version of the Bible, and on and on. He loved those books; I loved them too! And then I sit in our living room and look around at the little brass table that we found at an estate sale in Germany, and the two end tables that we splurged on in Oklahoma City when we first moved back to the States, and the light fixture that Sherrylee found in the antique store in South Dakota, and the many baskets that she likes to decorate with. OK, that’s just stuff! But what about the beautiful rug that we paid good money for in Turkey, the silver that I gave to Sherrylee as a wedding present (actually only a couple of place settings), the little nutcrackers that we’ve had since our days in Germany, the etching of the Marktkirche in Hannover or the Matrushka dolls made to resemble our family from Russia????? This is not “stuff!” These are from our LIFE! These are our history! Grab the pictures! Find the home movies! That’s what we save from the fire!! The garage sale at Mom’s has been a good reminder to me that we are going to leave it all, that someday our family pictures will be hanging in Cracker Barrel, that what we are so emotionally attached to is, in truth, just stuff to those without our memories. 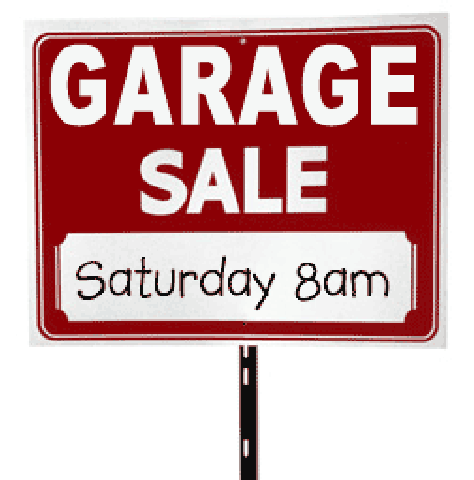 If you don’t really believe that moths and rust don’t eat up all your earthly “treasures,” just come to our garage sale on Saturday! Great column, Mark. So true and so well said!